The seller, Boris Georgiev, a retired Soviet Army colonel, told BBC News he was "acting on behalf a friend". According to Mr Georgiev, the 16th-Century relic was brought to St Petersburg at the height of the Bolshevik anti-religion campaign in the 1920s. The remains allegedly arrived from Novgorod, an ancient city in northern Russia, and became part of the St Petersburg Atheism Museum. But after the collapse of the Soviet Union the museum was closed. The exhibit from Novgorod - along with many others - was allegedly packed in a nondescript box and stored on the top floor of St Petersburg's Kazan Cathedral. Mr Georgiev told the BBC that the current owner of the remains had salvaged one of the boxes when the museum stock was being destroyed during the early 1990s. "There was initially no price set for the relic," said Mr Georgiev. "But I suggested to the owner it might sell for at least 1,000 euros (£660). This isn't a lot of money - but our web page has been up for 18 months, and we've had very few callers up to now." But after the Church authorities found out about the ad, interest soared. "My phone has been ringing all day today," Mr Georgiev said on Monday. "But I have to disappoint potential bidders: the relic is no longer on sale. This morning, the owner called me to say she'd changed her mind." So for now the bones will probably remain where they are, in a private flat in St Petersburg. The owner - whose name Mr Georgiev would not disclose - is now said to be unsure what to do with them. 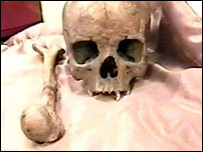 The Russian Orthodox Church declined to confirm whether the remains were genuine. But its representatives described the ad as "blasphemous". "Whatever the subject of this advertisement is - a sacred relic or human remains described as remains of a saint for commercial reasons - an attempt to sell it is immoral," the Church said in a statement published on its website on Monday.